The ruling Peacock Emperors of China had developed the fireworks, but their ambitious son had taken the explosive power for his own agenda. His parents exile him from the castle and later die of a broken heart from their son's betrayal. A soothsayer has predicted that Shen will be defeated by someone with the power of dark and light. Lord Shen is determined to return and rule the world by any means necessary. 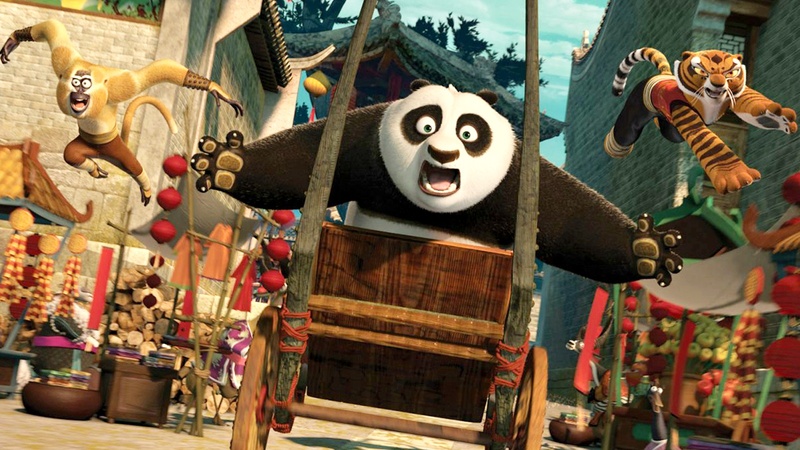 Big panda Po (Jack Black) who is now the Kung Fu Dragon Warrior is still learning his craft from red panda Master Shifu (Dustin Hoffman) who is attempting to teach him to find his inner peace. Po is now protecting the Valley of Peace with his friends and fellow kung fu masters, Mantis (Seth Rogan), Monkey (Jackie Chan), Crane (David Cross), Viper (Lucy Liu) and Tigress (Angelina Jolie). Their village is attacked by Lord's Shen (Gary Oldman) army of wolves for it's metals which he needs to complete his secret weapon that will take over the world. While fighting one of the wolves Po is mesmerized by the red insignia on the wolf's uniform. It stirs a memory that he can't seem to grasp. He goes home to ask his goose father Mr. Ping (James Hong) who runs a noodle shop if he's his real father. Ping reluctantly tells him how he was found in a box of radishes. When Gongman City is attacked by a powerful weapon, Po and his friends head to the city to enlist Master Storming Ox (Dennis Haybert), Master Croc (Jean-Claude Van Damme) and Master Thundering Rhino (Victor Graber). The masters have been imprisoned and not eager to leave. They are afraid a confrontation will lead Shen to target the city with the dangerous weapons created by Lord Shen. The team has to find a way to stop the war ships being armed in the harbor. When the team is captured and they face Lord Shen Po realizes that he may have something to do with past. The soothsayer (Michelle Yeoh) later helps Po reconcile his nightmares that helps him find his inner peace to defeat Lord Shen. Korean-American director Jennifer Yuh was head of story on the first Kung Fu Panda working with returning writers Jonathan Aibel and Glenn Berger. Usually sequels are just rehashing what happened in the first film, but this outing keeps the freshness from the first. Black is his typical wise guy mode, is kept in place by Jolie's Tigress, and the other kung fu critters who really don't have all that much to do. The storyline is fairly formula but this is after all a kid's movie. Unexplained point: outside of the different animals in the major roles, the populace of this world is filled with little cute rabbits. Once again we have to endure those 3D glasses which you hopefully can avoid and save the extra cost by seeing it in 2D. Despite all the big name cast it's really just another Jack Black movie with another adventure soon to come.